The sights on audio label features audio history guides produced and distributed by German publisher Andreas Janowski Verlag. With more information than a guided venue tour can offer, the audio books are a compact entertaining alternative to travel and history books. 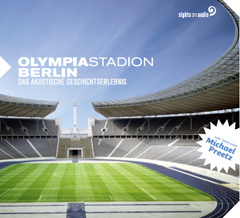 The latest audio book "Olympic Stadium Berlin - Listen to History" is currently available in German, the English version will be released at the end of October 2007. The audio book can easily be downloaded at various Web portals such as iTunes. "Olympic Stadium Berlin" is the first in the "Listen to History" series, upcoming audio history guides are currently in production. Narrated by Viktor Pavel, enhanced with music and sounds for an exciting audio experience.